Archaeologists in Egypt have discovered a horde of mummies 40km south of Cairo. Watch here. TAP Air Portugal takes delivery of the world’s first new generation widebody Airbus A330neo. Watch here. 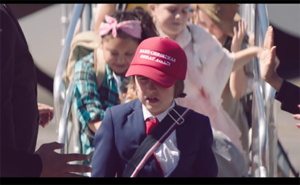 US President Donald Trump is on Air New Zealand’s Christmas naughty list. Watch here. A Syrian refugee who lived for seven months in Kuala Lumpur airport has a new home in Canada. Watch here. Think Storm Diana was bad? Watch here as four waterspouts form near an island in Thailand. It’s not every day you spot a dolphin – especially one swimming in the River Liffey in the heart of Dublin. Watch here. MSC were announced as overall sponsors of the Irish Travel Trade awards at the ITAA annual conference in Philadelphia. Voting is open for the awards which take place on January 25, 2018. The Irish Travel Advisors Association? 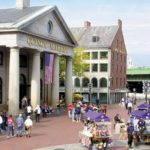 Genevive Strand, a speaker at the ITAA annual conference, held in Philadelphia for the first time, told how ASTA changes its name from Travel Agents to Travel Advisors after extensive consumer research. The business sessions of the conference tackled changes in technology with Simon Ferguson of Travelport, Mariana Fonseca of American Airlines and ITAA aviation representative Valerie Metcalfe, the American experience with ASTA lobbyists Genevive Strand, Shaun Balani and ITAA members Paula Coughlan and a robust questions and answers explanation session where Bill Byrne of Aer Lingus answered questions about his support for the travel trade, and Cathy Mannion of CAR fielded questions about the Commission and the upcoming package holiday directive (“clear as mud” was CEO Pat Dawson’s comment), with ITAA member Maureen Delmar. The conference was moderated by Travel Extra‘s Eoghan Corry. Cordoba was named as the venue for the next ITAA conference in October 2019. Tourism Ireland launched its marketing plans for 2019 – and aims to increase inbound visitor numbers to almost double the island’s population – 11.67m – next year. It’s launching its first marketing campaign in seven years, Fill your heart with Ireland, said CEO Niall Gibbons (watch here), who also revealed that tourism numbers from China are due to hit 100,000 by the end of the year. Tourism Minister Shane Ross said that the growth achieved in 2018 had been “stellar” (watch here). Full story from the event here. 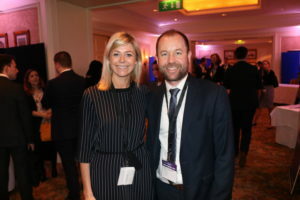 Hundreds of delegates attended the event in Dublin’s InterContinental hotel, including Aer Lingus’ Director of Sales Yvonne Muldoon, who’s just back from maternity leave and in the thick of the action. She’s pictured with Eoghan O’Mara Walsh, CEO of the Irish Tourism Industry Confederation. See more pictures here or connect to the album on Facebook. 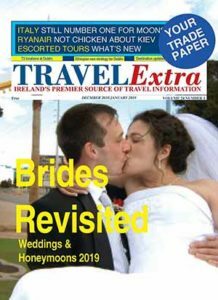 The January 2019 print edition of Travel Extra is arriving in agencies. It includes discussion of the dramatic changes to the role of the Commission of Aviation Regulation in advance of the package holiday directive, destination review of Seville and the enchanting story of the Christmas Carol, Silent Night, which was composed 200 years ago in December 1818 See here for online version. Despite the events taking place across the pond, it was a packed house at The Ivy for the Emirates Christmas lunch, kicking off the festive season. 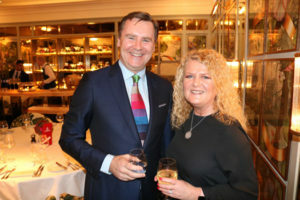 Enda Corneille, Country Manager, is pictured with Fiona Dobbyn, Classic Resorts. See more pictures here or connect to the album on Facebook. Complaints from customers about lack of sun are par for the course in the trade – now snow in Lapland is the issue, with a woman talking to Joe Duffy about her Lapland trip. Listen here. Joe Tully is to close his Newbridge branch and concentrate his business in Carlow. There were once seven travel agencies in Newbridge: Budget, Tully’s/Curragh, Toolin’s, Sundial, Brady Byrne, and the two survivors, Newbridge Travel and Cill Dara. 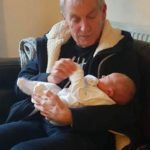 Greg Evans of the Greg Evans Consultancy has had his hands full this week. Even before the events in Philly, he was minding people – in this case, as the pictures show, his new-born grandson. 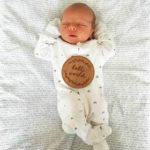 Ralph Harry Regan was born on November 23, weighing in at 7lbs 11oz. 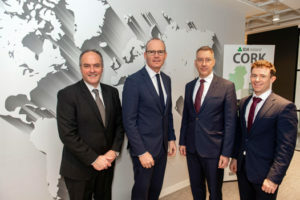 Irish travel software firm Datalex has appointed Nama’s former chief financial officer, Dónal Rooney, as its new CFO, starting on December 5. John Devereux of Travopia & American Holidays won the service to the industry award at Michael Flood’s ITTN awards in Dublin. Cassidy Travel won the agency award. Ireland’s outbound traffic is up 6.2pc in October. Cobh native Jackie Coakley has joined the East Cork Travel / Discover Travel team in Midleton. She is considered one of the top Cruise experts in her field. The Thai cave complex where a football team was trapped for 17 days has become a tourist hotspot. An Italian clifftop village is charging tourists €5 to enter, the mayor says it also gets you free popcorn, a doughnut, candyfloss and a drink. A passenger on an Indian flight was offloaded and detained after he photographed himself and used a caption that included the word “terrorist” to send on Snapchat. 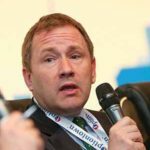 A passenger had his Aeroflot platinum frequent-flyer status revoked for criticising the airline’s chief executive in a tweet. A Japan Airlines pilot who reported for a London-Tokyo flight almost 10 times over the alcohol limit has been sentenced to 10 months in prison. A businessman has lost a £10,000 compensation claim for injury by being seated next to a “22 stone” passenger on a long-haul flight. A pilot is under investigation after falling asleep in the cockpit of his aircraft and overflying his Australian destination by 46km. Trendy silent discos in Edinburgh face a crackdown – because they are too noisy. Divers retrieved dozens of bodies after a packed cruise boat capsized in Lake Victoria off Uganda’s coast. Weeks after building the world’s tallest statue, India could get one that is even taller. Disneyland Paris is to double in size and may feature a third theme park area. 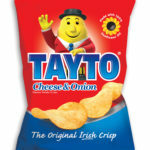 Tayto Crisps are the food most missed by Irish emigrants, according to the sixth annual ‘Diaspora Decides’ study, undertaken by Behaviour & Attitudes on behalf of Checkout magazine. Next in line were Cadbury chocolate, Barry’s tea, Kerrygold butter, Denny rashers and Guinness. Pre-tax profits at Eddie Rocket’s (Ireland) fell to €234,208 last year, with a €1.44m exceptional cost contributing to the decline as revenues rose 17pc. Supermac‘s pre-tax profits rose to €21.88m last year, with revenues jumping 15pc to €157.4m. Kenneth Murphy has been appointed Executive Chef of Kilkenny’s Lyrath Estate. 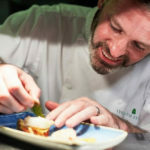 His career has taken to Dublin’s Westbury Hotel as Chef de Partie, Dublin’s Shelbourne Hotel, Anantara Resorts and Spa in the Maldives, and Cunard’s QE2, where he was part of a team preparing meals for almost 2,000 passengers and over 1,000 crew each day. Blackwater Distillery in Co Waterford has become the 21st operational Irish whiskey distillery on the island of Ireland. The world’s biggest hotel company, Marriott International, revealed that the personal details of up to half a billion guests at its Starwood Hotels and Resorts were at risk as a result of a massive data breach that had been going on since 2014. Singaporean businessmen Stanley Quek and Peng Loh who own the Trinity Townhouse acquired Sheen Falls in Kenmare, Co Kerry. 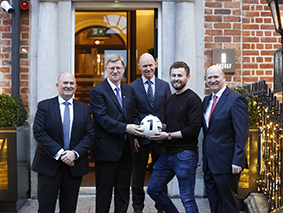 A No 7 star – Dublin footballer Jack McCaffrey – opened Hotel 7, Gardiner Row. The latest hotel in the capital is managed by Dalata Hotel Group alongside the Cassidy Group. The 51-bedroom hotel, situated in the north inner city, features a cocktail bar and restaurant. Martin Cassidy, Donnie Cassidy, Donal Cassidy, Jack McCaffrey and Peter Cassidy are pictured at the official launch. See more pictures here or connect to the album on Facebook. Hostelworld expects its growth in earnings before interest, tax, depreciation and amortisation next year to be “modest” but said it is in “attractive and growing market”. Staycity is openings its fourth aparthotel in Dublin this week, with the launch of a 50-apartment property on Chancery Lane. Revenues at Dublin’s Morrison Hotel rose to €13.4m, with profits up more than a quarter to over €1.8m. Tributes have been paid to Richard Gracey from Belfast, who was employed by Swissport at Dublin airport and died as a result of an accident when he was working on cargo on the ground around 10.30am on Saturday. Norwegian Air is to reduce Dublin-Newburgh from double daily to daily until March and drop its Shannon to Newburgh daily flight from January 12th until March 31st, and will remain seasonal. AF Cork to CDG flight will change to a morning flight on Cityjet from next summer. Galway West TD and Minister of State for the Islands Seán Kyne said a deal has been struck that will ensure that Aer Arann will continue to run flights to the Aran Islands up to December 20 and the Department of Culture, Heritage and the Gaeltacht has agreed a deal with Aer Arann to use Connemara’s Aerfort na Mine for air services up to September 2021. The IAA said it identified what caused the outage which interrupted services at Dublin Airport- and it wasn’t caused by a malicious hack. Small Planet Airlines Lithuania, Germany, Poland, and Cambodia has ceased operations. Boeing is to launch a software upgrade for its 737 MAX aircraft following last month’s deadly Lion Air crew crash in Indonesia. 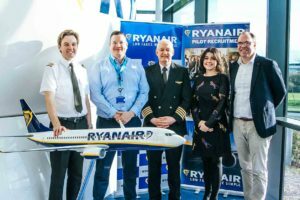 Ryanair announced a pilot-training partnership with ATO SKY4u to deliver a Ryanair Airline Pilot Standard programme in Berlin and Vienna with 450 new pilots from across Europe to be recruited and trained by SKY4u. Picture shows Edward Bellamy, Cadet, Ryanair; Kay Wachtelborn, Head of Training and CEO, Sky4U; Andy O’Shea, Head of Crew Training Captain, Ryanair; Roisín O’Shea, SKY4U APS MCC Project Manager Sky4U; and John Dooly, Operations Development General Manager, Ryanair. The Financial Times reported that the US and Westminster are about to sign next week a new aviation agreement to be in effect after Brexit. Per the article, the agreement appears to be the standard US one especially in terms of ownership but current airlines will be grandfathered. Pre-tax profits at the firm behind Knock Ireland West Airport tripled to €1.67m as passenger numbers reached 750,000 for the first time in the airport’s history. Dublin Airport held an event to attract the unemployed to seek jobs on the new North Runway project. Paraic McCarthy, Roadbridge FCC, Adeline O’Brien, CEO of Empower, actor and comedian Eric Lalor, and David Frizell, North Runway Project Manager are pictured at the event. Full story here. Dropping off or collecting passengers at Cork Airport will incur charges if you stay longer than 15 minutes. Ryanair launched legal action against the Revenue Commissioners and the Minister for Finance over tax laws the company says require it to place European staff on Irish contracts. New EU rules requiring tougher security screening of air travellers’ baggage will cost regional Irish airports €14m. Ryanair has launched a ‘Name a Plane & Fly to Spain’ competition and fundraiser in aid of ISPCC Childline, its 2018 charity partner. 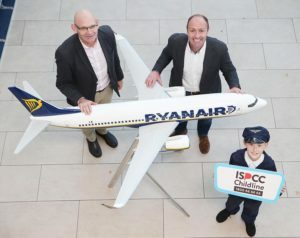 John Church, CEO, ISPCC; Kenny Jacobs, Chief Marketing Officer, Ryanair; Philip Stafford (10), Scoil an Duinnínigh, Drynam, Swords, were at the launch. Photo: Leon Farrell/Photocall Ireland. Full story here. Mets-cov warning notices have been posted in Dublin Airport. Dublin and Oslo will be the first two destinations for BA’s new A321Neo when service starts on December 2. Hibernian Airlines has registered as a wet-lease provider, wholly-owned by Inversiones Líneas Aéreas Internacionales, the parent of Air Nostrum and prospective associate of CityJet. 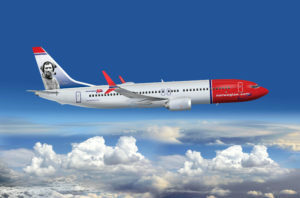 Norwegian is to take on dominant player British Airways on the London-Rio route, with advertised single fares of £240 each way. Irish airline CityJet was named Regional Airline of the Year at the CAPA Aviation Awards in Berlin. Qantas was named overall airline of the year; WOW (low cost airline), Orlando (large airport over 30m passengers) and Air Malta (turnaround airline). Aer Lingus paid directors, including outgoing CEO Stephen Kavanagh (pictured), Chief Financial Officer Rachel Izzard and Chief Operating Officer Mike Rutter, a total of €4.3m last year, up from €3.4m in 2016. The airline also paid a €200m dividend to its Welsh-based holding firm on the back of record profits. Southwest Airlines apologised after an employee mocked the name of a five-year-old passenger. A United flight to Chattanooga operated by SkyWest had to return to Chicago because the 76-seat Embraer aircraft used on the first flight was too big for ground personnel to handle. Aer Lingus have acquired two 737-400s from Blue Air to be ferried to the US for the winter before returning to service. Fortress Investment are favourites to buy Waypoint Leasing, the world’s second largest helicopter leasing company, which filed for Chapter 11 protection in New York for 100 companies and trusts including Waypoint Leasing Ireland. The lessor manages 166 aircraft, valued at US$1.6 bn, with orders and options for 70 more valued at more than $700m over the next five years. Eurocontrol estimates that total delay minutes in European aviation will be up 53pc this year due to strikes and capacity shortages. It says flights have been delayed by a total of 14.3m minutes compared with 9.3m in 2017. Lobby group Airlines for Europe said “swift and decisive action” is needed to reform Europe’s air traffic management system. 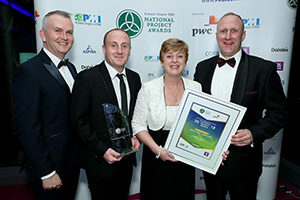 Picture shows Kevin Cullinane, Nathan Wall, Yvonne O Rourke, and Kevin Cotter of Cork Airport with the Social Good – Corporate award at the Ireland Chapter of Project Management Institute Awards for the airport’s project management around fundraising, including the annual 5km Runway Run. Air France CEO Ben Smith has decided to terminate Joon, which commenced operations in december targeted at young people. Ryanair’s Head of Communications Robin Kiely is leaving the business in the spring to spend more time with his young family before seeking a new challenge. The airline is seeking a new Head of Communications. 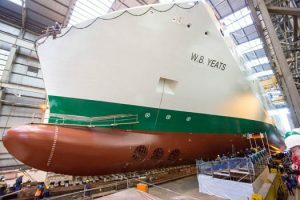 Irish Continental Group trading update said WB Yeats completed its sea-trials in early November and will be ready for delivery during early December. Revenue was down 1.3pc to €285.3m due to sailing disruptions and schedule changes. Volume of cars fell by 7.2pc to 365,400 owing to a 7.3pc loss in sailings. Kelly Craighead is replacing Cindy D’Aoust as President and CEO of CLIA from January 1, 2019. Ms Craighead most recently served as deputy assistant secretary for travel and tourism in the US Department of Commerce. Construction has begun in China on the third new Stena Line ship to be deployed on Irish Sea routes. 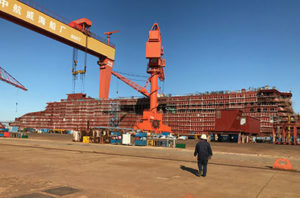 The first of the E-Flexer ships is pictured at the Avic Weihai Shipyard in China. The first vessel will commence operations on the Holyhead to Dublin route in early 2020. Full story here. Celebrity Apex, Celebrity Cruises’ second ship in its Edge Class, will offer a full season of European sailings when it debuts in 2020. The ship is scheduled to launch in Southampton in spring 2020. Royal Caribbean passengers can now bid on an upgrade to a higher cabin category. “Royal Up” will be available on select sailings. MSC Cruises named its first Seaside EVO-class ship MSC Seashore at a steel-cutting ceremony at Fincantieri’s Monfalcone shipyard in Italy. MSC Cruises also confirmed it is looking to turn Trieste into a homeport from summer 2020. 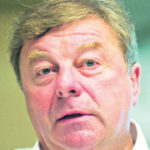 Clem Walshe is to represent Jetline cruises in ireland. Children’s passports can now be renewed online under a passport service first introduced for adults in 2017. Trips to Ireland are up 7.3pc in October, Britain up 0.1pc, up 5.4pc, N America up 20.2pc and Africa/Asia by 17.1pc. Germany was up 30pc, 17pc and 21pc in the last three quarters. Tourism Ireland’s 2019 launch event in Belfast predicted 2.23m visitors in 2018, up 3pc. A new campaign will highlight the area as ‘Game of Thrones Territory’ with the final series airing next spring and Tourism Ireland will highlight The British Open at Royal Portrush. 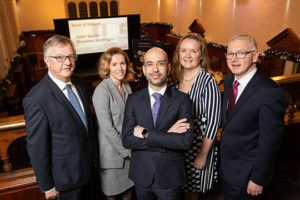 Tourism Ireland said the significant increase in bedroom capacity in Belfast and Derry presents opportunities, with city break campaigns rolling out in the first and last three months of 2019. Tourism Ireland CEO Niall Gibbons warned that the North’s dependence on the British market could be an issue under a hard Brexit. He said it’s “more vulnerable than other regions because if the British decide to stay at home, it’s places like Devon, Cornwall, the Lake District and Scotland that are more likely to benefit”. Ray Coyle’s Tayto Park is aiming to build an ‘iconic’ €14m rollercoaster, which would be the same height as the park’s 32m-high Cú Chulainn but will be 400m longer at 1,482m. Ireland has been named the fifth-best worldwide honeymoon destinations for LGBT couples by The Latin America Travel Company. Canada took top position, with Switzerland the only European country ahead of Ireland. 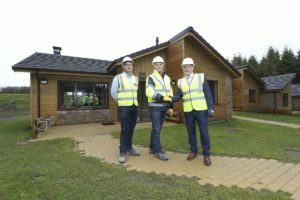 Rapid-build home manufacturer FastHouse announced the completion of its contract to provide and erect the timber frames for 466 lodges at Center Parcs in Longford. Pictured are Sisk Senior Contracts Manager Cormac Fitzpatrick, Center Parcs Construction and Development Director Paul Kent and FastHouse Sales and Installations Director Sean Fox. Photo: Conor McCabe Photography. 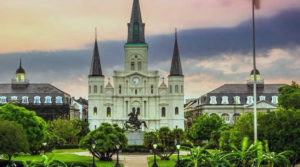 Insight Vacations offers: Italian Intermezzo escorted tour, includes flights, transfers, and 8 nights’ accommodation in central locations, was €2,629pps, now from €2,399pps. Flight cost must be paid at the time of booking. Book and pay in full by 28 February 2019, depart July 28. www.insightvacations.com or call 01 775 3803. TUI offers: Dublin to Tenerife, 7 nights half board 3*+ Catalonia Las Vegas, Puerto De la Cruz, from €399pps, depart January 18. Dublin to Gran Canaria, 7 nights half board 4* RIU Don Miguel, Playa Del Ingles, from €519pps, depart January 24. Dublin to Lanzarote, 7 nights half board 4* Vik San Antonio, Puerto Del Carmen, from €579pps, depart January 6. Dublin to Cancun, 14 nights all inclusive 3* RIU Lupita, Playacar, from €1,619pps. (Saving of €200pp), depart June 17. Dublin to Cancun, 14 nights all inclusive 4* Grand Bahia Principe Coba, Riviera Maya, from €1,629pps (Saving of €300pp), depart June 17. 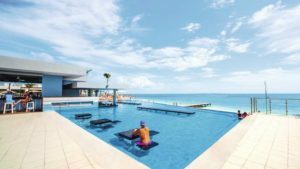 Dublin to Cancun, 14 nights all inclusive 5* Grand Sirenis Resort, Riviera Maya, from €1,829pps (Saving of €270pp), depart June 17. Dublin to Verona, 7 nights B&B 3* Hotel Astoria, Garda, Lake Garda, from €696pp, depart May 25. 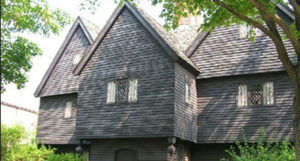 Dublin to Verona, 7 nights B&B 3* Hotel Bardolino, Bardolino, Lake Garda, from €716pp, depart June 1. Dublin to Verona, 7 nights half board 4 La Perla, Garda, Lake Garda, from €926pp, depart June 8. 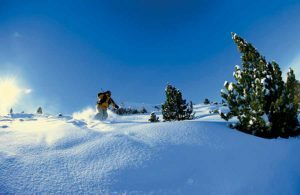 Dublin to Salzburg, 7 nights B&B 3* Hotel Obermair, Mayrhofen, from €627pp, depart May 29. Dublin to Salzburg, 7 nights half board 4* Hotel Best Western Kranjska Gora, Kranjska Gora, from €660pp, depart June 5. Dublin to Salzburg, 7 nights half board 4* Hotel Steinbach, Ruhpolding, from €840pps, depart June 12. Dublin to Tenerife, 7 nights full board, inside cabin on cruise ship Marella Dream, from €819pps, depart February 8. https://www.tuiholidays.ie Call 1850 45 35 45 or visit a TUI Store /travel agent.